Improve your Mini Cooper's handling by replacing your stock, worn out rubber bushings with Powerflex Urethane Bushings. 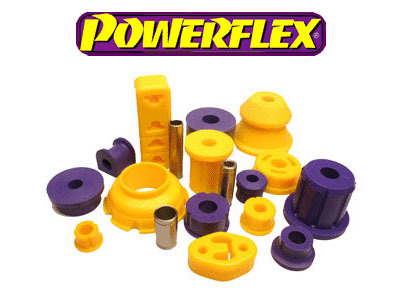 Powerflex bushings will not only improve your car's handling, but also prolong tire life. Powerflex bushings will get rid of your vehicles sloppy handling due to corroded rubber bushings, making every aspect of your car's handling more precise, and sure footed. Improve your car's handling drastically with the addition of Powerflex Urethane Suspension Bushings.